Scans/copies of the inserts that came with these. One has the Moyen praying skeletons and the other has the Ledney art. Can somebody scan or snap a pic of the back of the tray card for the first pressing of "Mocking the Philanthropist"? This? I have also seen it with the Moyen art. Whatever works for me. Was there any info inside? I'm looking for a decent scan of Seraphim's "All at the End" demo from 1991. A shoot in the dark but can anybody help me out with a copy/scan of Black Majesty - Ateh Gibor Le'olam Shaitan Demo 2007? Would be very nice. Thanks a ton for what I needed!!! 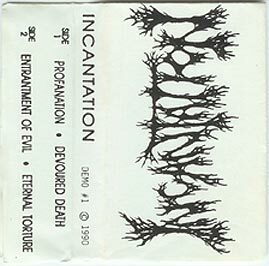 MORBID (swe) "December Moon" demo. can anyone scan me Sadistic Intent "Ancient Black Earth" tray cover? mine is soaked due to aircond leakage. damn. I have been in desperate need of the cd booklet/insert for the MYSTICUM "Streams of Inferno" cd on FULL MOON PROD. Empire of Blood scan, please.